02/07/2019 02/08/2019 - by Liam Weisman - 4 Comments. 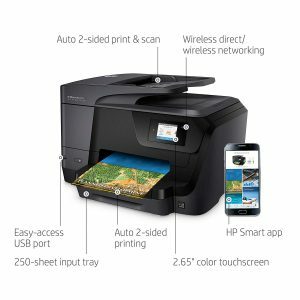 The HP Officejet Pro 8710 is an impressive All-in-one printer with a myriad of features that set it apart from its predecessors. The most notable features for this iteration is the competitive price, exceptional print quality, 2-sided ADF capability, efficient print speed, and NFC technology for wireless printing on PC and mobile phones. 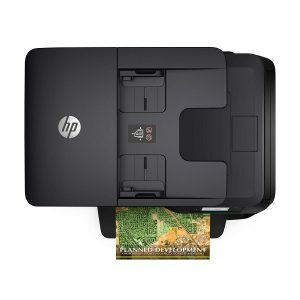 Also, consistent users can subscribe to HP Instant ink monthly subscription program, which the printer is eligible for, to bring down the printing costs per page. All in all, the HP Officejet Pro 8710 makes a solid claim as a competitive priced low-volume printer for busy households and offices use. While the HP Officejet Pro 8710 printer is a home printer for the budget user, its design is not essentially cheap. No, the build quality is eye-catching which is reminiscent of other premium HP printers. The HP Officejet Pro 8710 flaunts an all-black plastic chassis, a larger footprint (compared to predecessor 6978), and improved paper path for holding more capacity in its tray. Physically, it is identical to the HP Officejet Pro 6968 and with its other sister HP Officejet Pro 6978. However, the main difference between them is that the 8710 performs better in speed (22 ppm on black print) and has a larger input and output/ capacity (250 sheets, 150 sheets). At 250 sheets, it’s much more than the two mentioned but we’ll get to that later. Its successors the HP Officejet Pro 8720 and HP Officejet Pro 8740 share a similar design, color (white accents) and performance capacity. They are also much larger in respect to our unit but I digress. Measuring 19.7 x 15.9 x 13.4 inches with its trays closed and 24.54 pounds, the Officejet 8710 is significantly larger and heavier than the 6968 and 6978. Still, while not the most petite printer in its category, it is a compact and comfortable fit for tightly space conscious home and office tables. Under this pretty face design is the auto duplexing document feeder (ADF) for sending multiple documents to the scanner. For the most part, this is single feature and a larger tray are what sets it apart from the HP Officejet 6968 and 6978. Speaking of trays, HP revised this printer’s tray capacity such that it handles more papers, essentially half a rim (250 sheets input, 150 sheets). In practice, that is more than what the Officejet 6968 and 6978 offer at 225 sheets input and 60 sheets output. It is an improvement for HP and its iteration of printers but nothing much in contrast to MB2720’s 500 sheets split between two 250-sheet drawers. Both of these AIO printers have ADF for automatically feeding documents to the scanner, an aspect that busy small offices will find very handy. The Officejet Pro 8710 ADF allows it to feed documents at a 35-sheets capacity which is smaller compared to MB2720’s 50 sheets. However, the 8710 trudges ahead of the MB2720 for being the only one supporting two-sided scanning, a treasure trove for home and office settings. Nothing much changed on the connectivity side of things on this new Officejet iteration. HP managed to include similar ports including Wi-Fi, Ethernet and a single USB port for connecting to a computer. With this unit, you also get HP’s equivalent to Wi-Fi Direct for making connections to your mobile/ smartphone via a network or router. Other connectivity options include AirPrint that supports Apple technology, Mopria for Android print support and HP’s own ePrint (enables your printer to own its own unique email address). In terms of scanning, the scanner can save in multiple formats including BMP, JPEG, PNG, RTF, TIF, TXT, and image and searchable PDF. Additionally, you can scan and print from a USB thumb drive using the port located at the rear left side of the printer. Another of HP’s unique and futuristic features is the HP Jet Advantage Private Print. Don’t let the fancy name confuse you, it’s just that. A private printing option, meaning it allows you to secure your sensitive print jobs with a PIN. Most of these commands you make through the 2.65-inch colored touchscreen that controls the whole printer’s activities. The 8710’s software comes bundled on an optical disc or you can opt to download it from the latest HP support website. Nothing about the process is tedious; I would say it’s rather straightforward. All you have to do is throw in the optical disc in the drive and wait for the instructions to pop up once it loads. You will be asked whether to accept the software or download it from the website. Just follow the instructions from there or call support to help get you through it. Still, on software, there are other bundled software that comes with the package. The most notable one is the OCR meaning optical character recognition. What it does is simply allow you to convert documents to editable searchable texts. Other software available are the downloadable apps by Android and iOS which help in printing from your mobile device. We mentioned these in the ports section. According to HP, the Officejet 8710 has a print capacity of 22 pages per minute (ppm), a solid improvement from the 20 ppm on the Officejet 6978. At this price range, that is definitely impressive. One thing though, is that HP needs to offer better performance in terms of print capacity at this budget price range. A consistent increase of only 2 pages per minute (18 ppm on 6968 to 20 ppm on 6978 to 22 ppm on the 8710) for every iteration seems low and a bit mediocre. What I’m trying to say is, I’d love to see a number-crunching print performance figure for the next generation of printers, Something like 40 ppm for this price range. Anyways, that aside, the Officejet 8710 runs on a HP 952 Black cartridge with a page yield of up to 1,000 pages (if you’re printing monochrome). While that’s great, you can still opt for the HP 952 XL Black cartridge for higher yields (2000 pages), especially if you’re based in a busy small office setting. Without a doubt, you can always go for your very own cartridge ink from stores like Costco as the cartridges are readily available there. However, I wouldn’t advise that for two reasons. First, the expenses might boggle you down at the end of the day, that is the cost per page. Secondly, it’s not advisable to get 3rd part cartridges. While I haven’t done it myself, I’ve heard more than enough complaints of third-party cartridges failing to work (giving the “not genuine” error). Instead, I would recommend going for the Ink Service subscription that this printer qualifies for. I’m obviously not HP’s brand ambassador nor am I sponsored to market their products. After the 1000 pages ink, your cost of printing spikes up. Getting the in-house refill makes sense in terms of cost per page. The 952 XL monochrome cartridge offers 2000 pages in black and 1800 pages in color. That translates to 2.2 cents per page which is awfully affordable and efficient. While all this spells out roses and candy for users, in some circumstances it might not be. It is a boon and bane kind of situation in this sense. 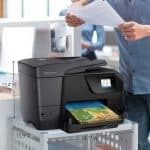 While the Officejet 8710’s efficiency might be an advantage for frequent users, it might not be so great for less frequent users. I’m looking at users who are only prone to printing one or two pages in a week; the ink might dry up. This is one of the reasons some users often return this printer. In that case, this isn’t the printer for you. There are other cheaper and viable options in the market for light-duty-family printers. The Canon Pixma-TR450 is one such home-based printer for family use. It’s a great value home printer that won’t empty your wallet. On the flip side, if you have more workload on your hands and the HP Officejet feels a bit slow, or just the 25,000 pages per month limit is low for you, then this printer isn’t for you too. Instead, we recommend the HP Officejet 8720 and Officejet 8740. Both can carry their own weight easily by handling intensive tasks effortlessly. But the Officejet strides ahead as a better performance and value option. Most inkjets excel at printing photos that are at least at par with the quality you’d expect from your local drugstore. The Officejet Pro 8710 does a decent job here as a home printer for printing a range of documents and as a photo printer. However, while that is true, it’s not the perfect recommended photo printer for professional photographers. It just doesn’t have the essential photo-centric features for producing higher quality crisp photos. Higher-end models offer a wealth of features that make them excel at printing high-quality pictures. Features such as optical drives to copy or burn images too. Also, a system capable of scanning 35mm films and print pictures from slides, negatives, memory cards, and cameras. So, this is just to make sure you don’t expect too much on that end. There’s more than a couple of reasons to love the HP Officejet Pro 8710 printer. It’s a budget-priced printer with great features, print/ photo quality, and print speed. If you print as many colored pages as monochrome and desire to keep your running costs down, the HP Instant Ink subscription service should work for you. The auto-duplexing ADF will also be great for users who want to scan both sides of their pages as the Officejet does it automatically (therefore saving time). 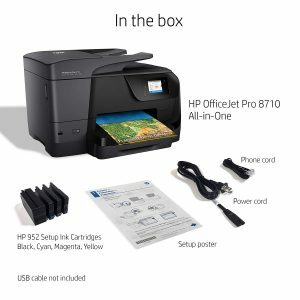 To sum it all up, the HP Officejet Pro 8710 brings a great share of awesome to this budget printer category. If a need for economic photo printing outweighs your desire for the best possible prints, specifically photo prints, then the HP model is a go-to choice. That also applies to the workload your home and office requires. We recommend it as our Editor’s Choice for budget entry-level printers.